With equities breaking new cycle highs, the VIX was naturally on the slide, melting lower across much of the day, settling -9.5% @ 14.52. Near term outlook offers a floor in the 14/13s, before the next opportunity of a move to at least challenge the key 20 threshold. VIX has been cut in half since the spike high of 31.06. In the next wave higher, the 18/22 zone looks a viable target. When will we next see the 30s... that is the great unknown. Considering the power of the ongoing equity up wave, it is increasingly (if not depressingly) doubtful that we'll test that spike high for some considerable time. *most notable today, a new historic high for the Transports, athough the same thing happened in early July 2011.. due to falling oil prices.. whilst other indexes put in lower highs. For those already short, today was a real pain grinder, and at least the first half of tomorrow won't likely offer anything good. The issue now is whether the market can somehow push higher after the FOMC fomally announce the end of QE3.. or if the market will sell the news.... at least down to the 1920/00 zone. Right now, the latter would be my best guess. Awaiting earnings from the FB. Well, a daily close in the sp'1970s looks pretty likely, and that is a big problem for those seeking a renewed wave lower. Even if we do see a reversal from the FOMC tomorrow... I'll be highly suspicious that we'll get stuck somewhere in the 1920/00 zone. ..its not the most pleasing of thoughts. 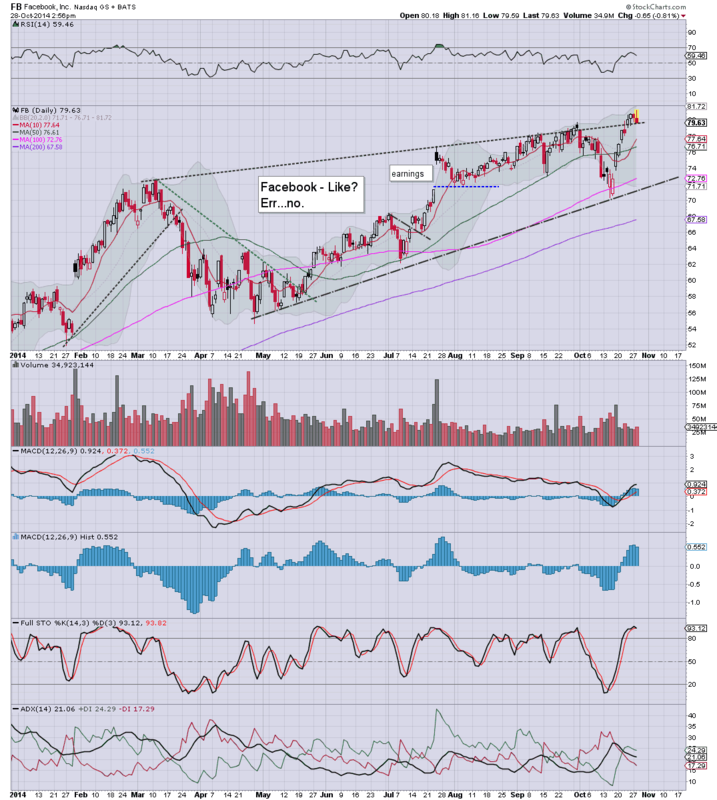 Notable weakness, FB -0.8%... ahead of earnings. 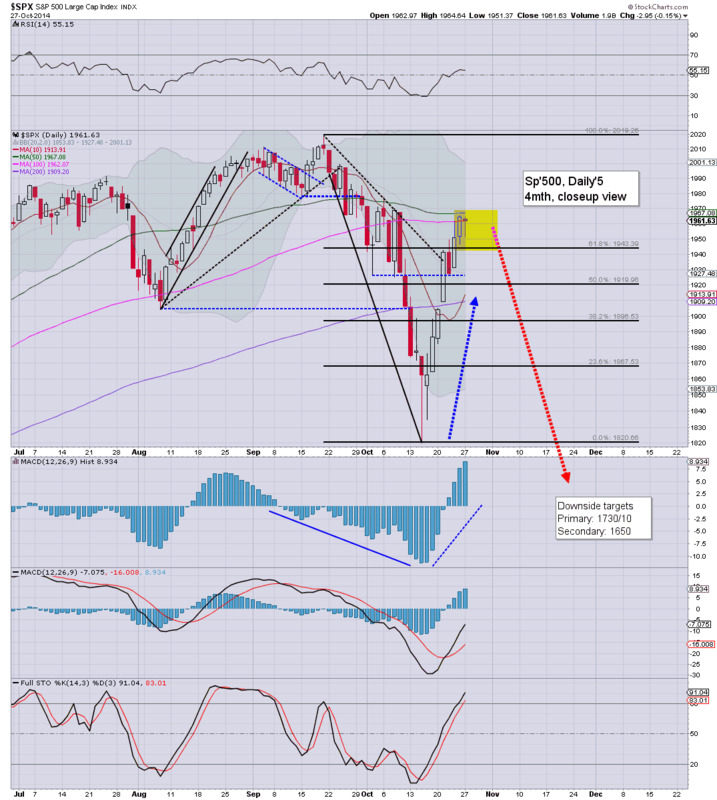 The daily MACD cycle is a lousy setup for the bulls... viable downside to the 50dma... if not the 200dma. 3.14pm.. King O' speaking on Ebola... 'everything is fine'..... so yeah... its fine now... nothing to worry about. Meanwhile... algo-bots are pleased.... sp'1980... VIX 14s. 3.32pm... Dow making a play for the 17k level. Just 2% away from a new historic high, which is roughly the same for the sp'500. Will this market melt down too? *surprisingly, even though its not Christmas morning, one of the UKs main film channels is broadcasting Wizard of Oz this early evening. 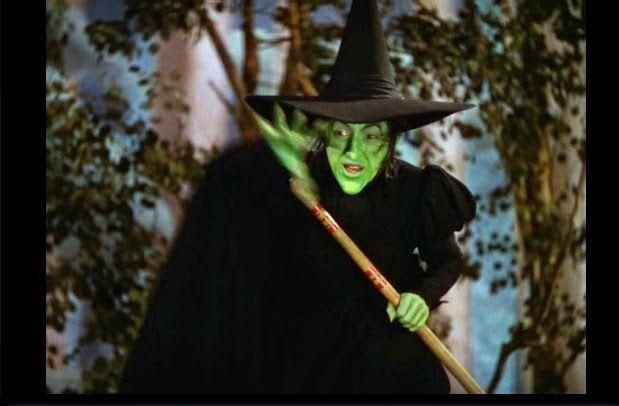 Little to add.... market remains in melt mode... but unlike the wicked witch... its melting..slowly... UP. Best guess... 'relative' chop into the FOMC.. before renewed downside... but with a new historic high for the Transports... we are now more likely to hold the 1920/00 zone.. than break back under it. yours... awaiting the munchkins.... somewhere over the rainbow. Equities are stuck in the resistance zone of the sp'1970s, with VIX -2% in the 15s. A reversal from 1970s to at least 1920s looks viable to begin from Wednesday afternoon. Oil is holding minor gains of 0.3%. We're 7.5 trading hours away from the FOMC announcement, there seems little reason for anyone to get involved ahead of it. Notable weakness: TWTR, -9.9% in the $43s, despite a minor recovery, it looks set for 40/39. US equity indexes continue to grind slowly higher, with a new cycle high of sp'1974. 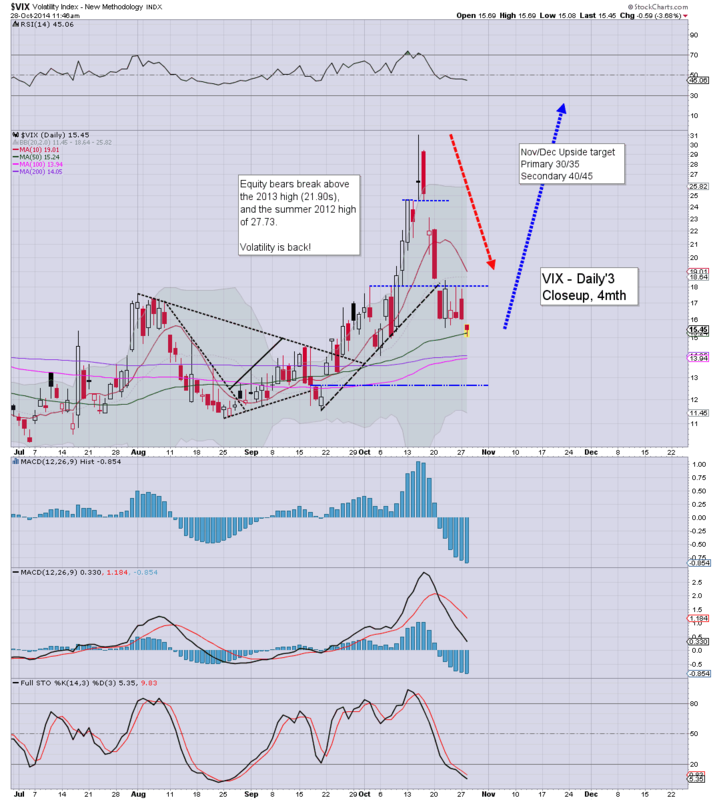 VIX remains in melt mode, -4% in the low 15s. The 14s look likely (if briefly) before a floor is in. Metals are increasingly weak, with Gold +$1.. a red close looks probable. So, we're in the resistance zone, and with the Fed tomorrow, there remains the chance of a reversal. What is still rattling in my mind is what I saw this morning on CNBC. The Liesman effectively calling for QE4 in the relatively near term. I have little more than contempt for any of the cheerleaders, and it was highly indicative of just how upset they have been by the recent down wave to the low sp'1800s. Lets be clear... the mainstream can NOT cope with a multi-week fall of more than 3-4%. If by some miracle we're even just testing the recent low in November, you can bet the mainstream will be screaming at the Fed for more 'market support'... which does seem likely.. no later than next spring. Notable strength: TSLA +6.7%, I've no idea why, I'd guess its just the momo chasers piling in once again. A daily close in the 1960s would be something for the bears, but without question... bulls have achieved a fair bit today.. not least with the Transports breaking a new high. Best guess... chop into the FOMC.. a brief spike to 1975/80 zone, and then a reversal.. with downside of 'some degree' into the weekly close. One thing bears could do with, a weekly close back above the weekly 200MA.. still in the 17s. Notable weakness, TWTR, next support is around 40/39... the low end of the gap from last earnings. 11.37am... grinding higher.. sp'1974... bearish capitulation ahead of the Fed? Probably. I realise some are looking for 1990/2000 before a minor down wave to 1950/20 zone, but really..90s look out of range this week.. even if the market can initially rally on the FOMC. So, we're battling higher again, and the breach into the sp'1970s is significant. Even more so, the Trans, which is very close to breaking a new historic high. 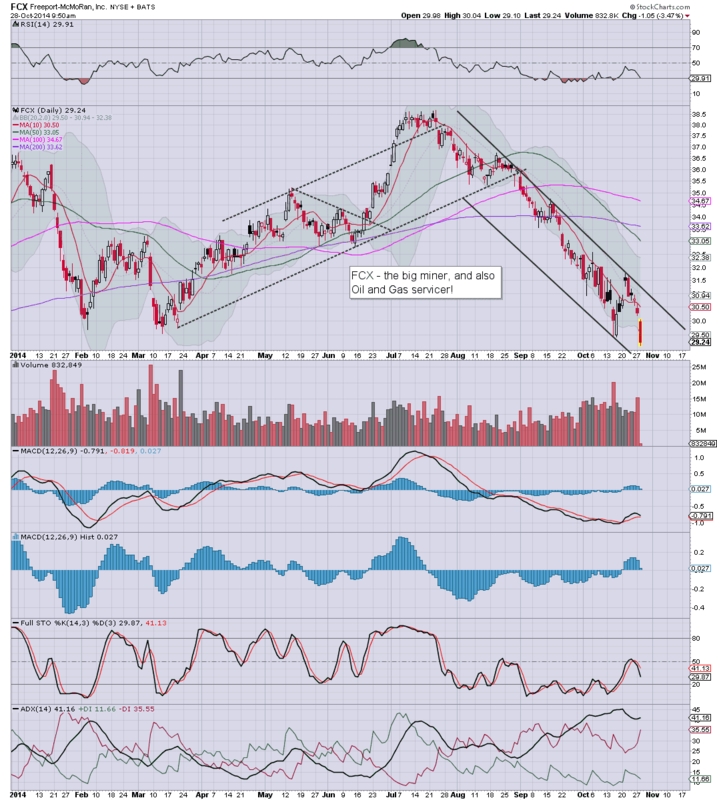 notable weakness, FCX, -3.5%, post earnings, suffering from lower copper prices. Great company, but whilst Copper prices continue to remain very weak - at the $3 threshold, miners are going to have real problems. The only good thing, fuel costs are lower. 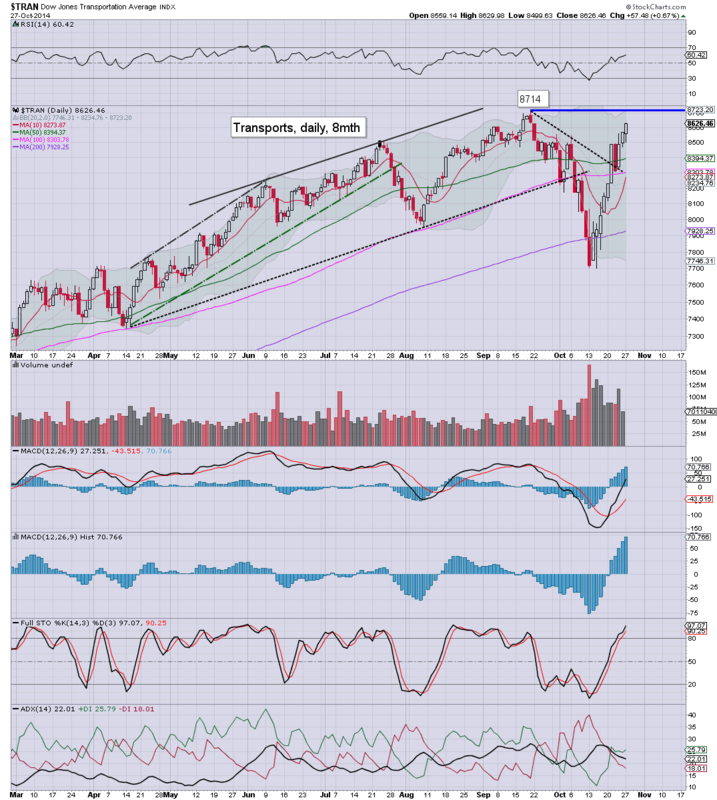 Transports break a NEW historic high of 8718. That is a huge victory for the equity bulls... all that is left are new highs in the headline indexes. 10.26am.. so.. new Trans high.. and sp'1970s... some 150pts, 6.5% above the recent low. With the Fed tomorrow afternoon, I ain't interested in getting involved ahead of that. Good morning. Futures are moderately higher, sp +9pts, we're set to open at 1970. Metals are bouncing, Gold +$6. A daily close in the sp'1970s would bode strongly against the bears, and be suggestive of new historic highs within the next few months. *Durable goods orders, -1.3%, much weaker than expected. So.. we're set for the 1970s this morning, a daily close in the 70s would do real damage to the notion of another major wave lower next month. Watching Liesman on clown finance TV right now, it is pretty incredible to see how confident the cheerleaders now are of QE4. The recent equity down wave of almost 10% is still rattling them, even though we have almost fully recovered the declines. Truly bizarre. A fair few out there are seeking the 1975/85 zone before a reversal, but really, that will turn the monthly cycles back to bullish. 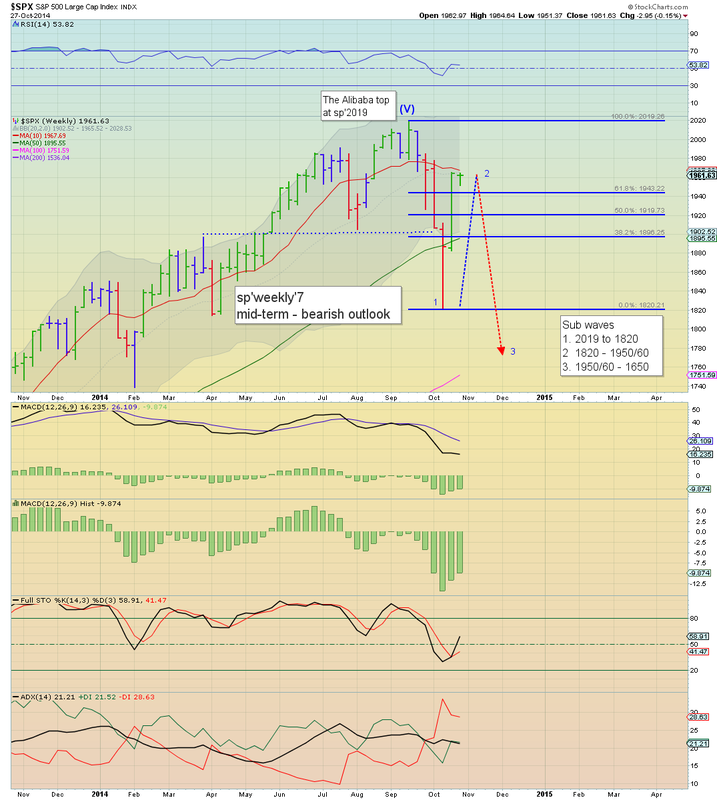 Equity bears must see a monthly close in the 1950s... or lower. 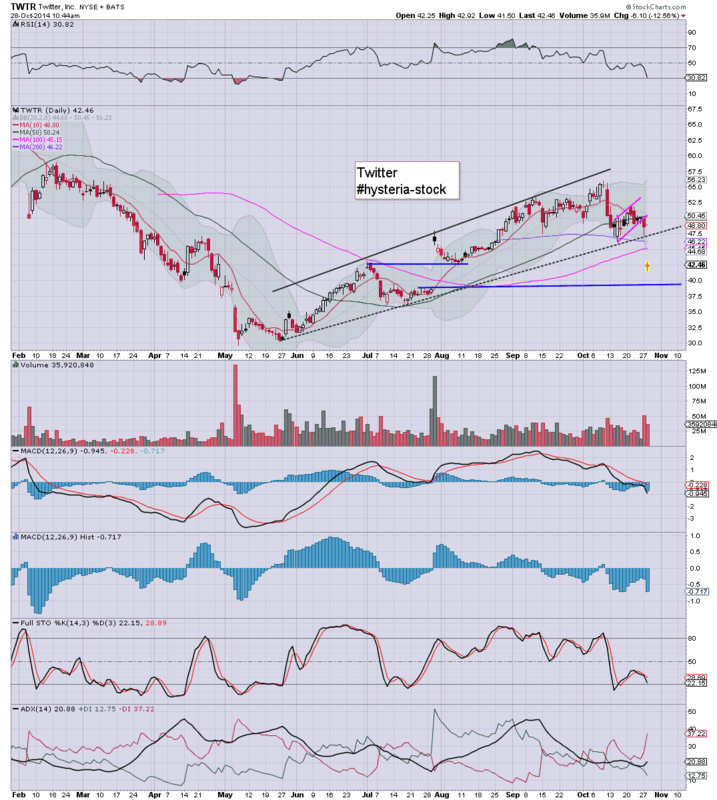 Notable early weakness, TWTR, -13.5% in the $42s.. next support is around $40. Strength: BABA +1.6% in the $99s. 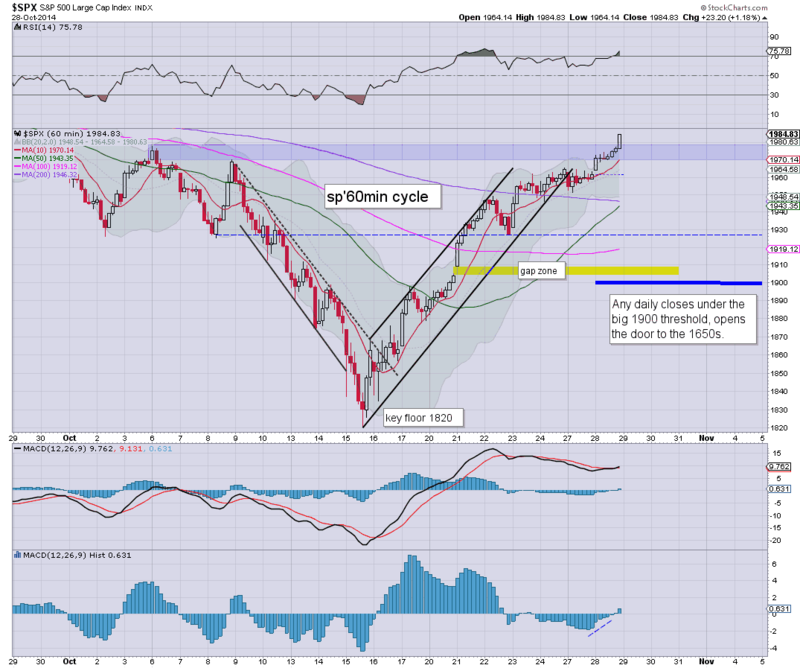 A break into the $100s would be pretty significant today. Many are seeking $120 within 6-9 months. US equities saw a day of minor weak chop, sp -3pts @ 1961. The two leaders - Trans/R2K settled +0.7% and -0.1% respectively. Near term outlook offers continued chop.. with a brief foray into the 1970s.. before a swift reversal. *the Transports continues to be a major problem for those in bear land. If it breaks new highs, then it would bode strongly against any kind of November 'crashy' scenario. 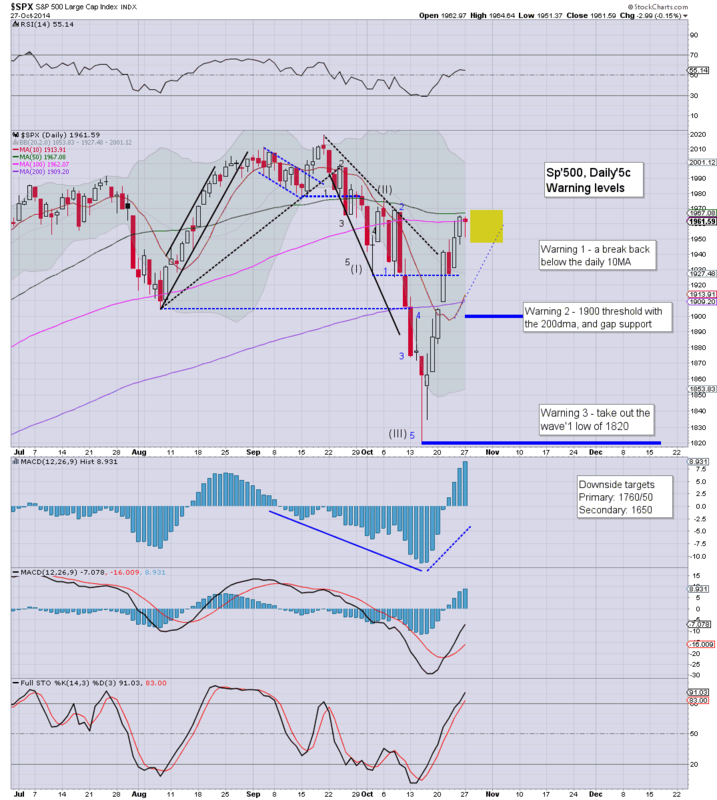 Another green candle is not unexpected, and prices are stuck just under the key weekly 10MA, currently @ 1967. A brief move into the 1970s is tolerable, but I would certainly want to see a weekly/monthly close in the 1950s to keep the bigger cycles bearish. Tuesday will see Durable Goods orders, case shiller HPI, richmond fed, and consumer conf'. That should be plenty to wake most traders up, but many will likely not want to get involved ahead of the Fed.